Each festivity in Italy is celebrated with different dishes. Baked cakes (e.g. panettone and pandoro) are tipical during Christmas, while Carnival menu is filled with deep fried cakes. 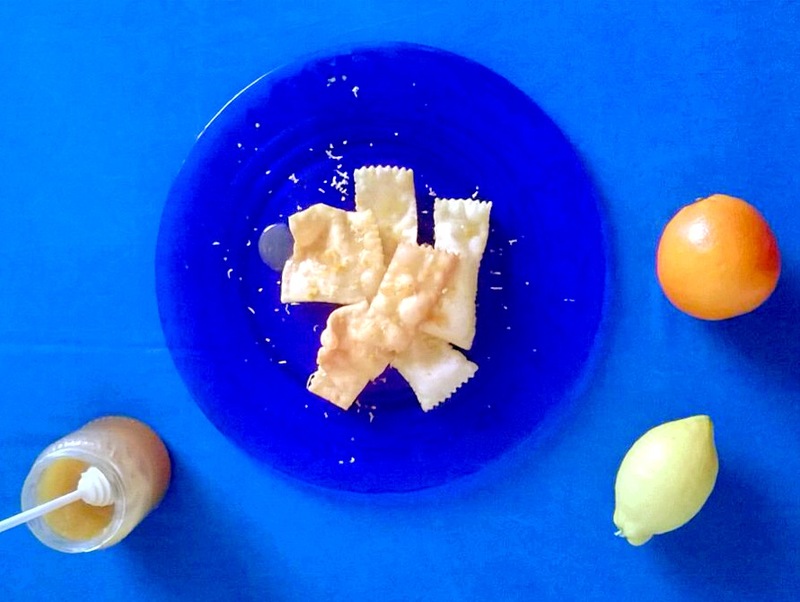 Strufoli (deep fried dough spheres) and frappe (deep fried dough stripes) are the most common in Umbria Region, though each area has got its own recipes. On this Mardì Gras 2015 (Martedì Grasso in Italy) I’d like to share with you Mom’s personal recipe for Frappe. It’s a quick, delicious recipe to obtain one of the most addictive cakes I know. According to the tradition, they should be eaten only during Carnival time: the truth is, they are so good you will not stop preparing them until it’s Easter! Ingredients: 500g flour – 3 eggs and 1 yolk – 2 tablespoons of peanut oil (alternatively sunflower oil) – 40g butter – 4 tablespoons of sugar– 4 tablespoons of rum – 4 tablespoons of grappa – 4 tablespoons of Mistrà liquor (or any aniceed-flavoured spirit) – 8g of powder yeast. To deep fry the frappe: 1-5-2 liters of peanut oil. You will also need either a pasta machine or a rolling pin. Preparation: Whisk together the flour and yeast in a medium mixing bowl. Create a deep well in the middle of the flour, crack the eggs into this well and mix. Then add the sugar, the softened butter (not melted though), the peanut oil and the spirits. Mix everything until you obtain a soft dough. If it is too runny (e.g. the eggs are very large), add a bit of extra flour. Place the dough in a container and cover with cling film. Let the dough rest in the fridge for 2-3h. Divide the dough into few equal portions. Sprinkle a large baking sheet generously with flour: you will place the frappe on this surface once you have cut them. 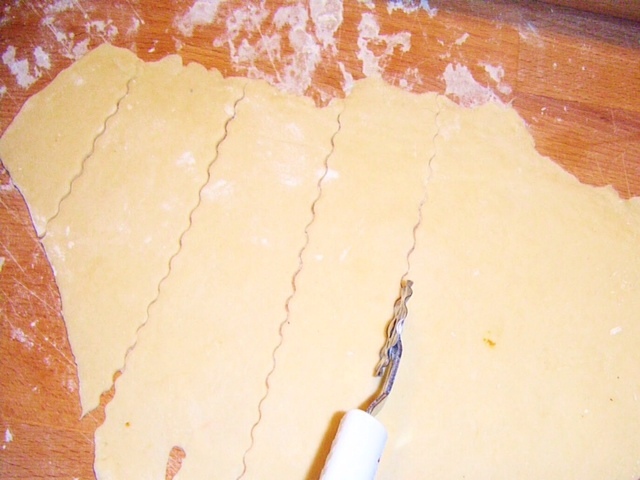 Set your pasta machine to the thickest setting and flatten one piece of dough into a thick sheet. Change the settings on your roller to roll the pasta thinner and thinner until it is 2-3mm thick. If the pasta-sheet gets too long to be managed, then cut it in half. Cut the long stretch of dough into large stripes (4cm x 15-20cm) and placed them on the baking sheet sprinkled with flour. To have a more decorated shape of each stripe, you could use a zigzag cutting wheel, the same you would use to cut ravioli. Heat peanut oil in a frying pan and, when the oil is hot (170-180C; I usually add a little piece of dough and, if it starts bubbling, it means it’s hot enough), add few stripes of dough, one by one: be careful they do not touch each other or they will stick together and become one single piece. Let them deep-fry until golden, then drain them with a draining spoon and place them on a kitchen-towel so that the extra oil will be absorbed by the towel. Repeat this operation until all the dough stripes are fried. At this point the frappe are done! Use your fantasy to season them. The seasoning I like most is honey and orange zest. Alternatively, you can try lemon and orange zest, or simply some sieved icing sugar. Delicious! 1) the shape of each “frappa” is very personal and can vary from region to region or even from person to person. I remember when I was a kid mom used to create thinner and longer stripes of dough and fold them in ribbon shaped frappe. 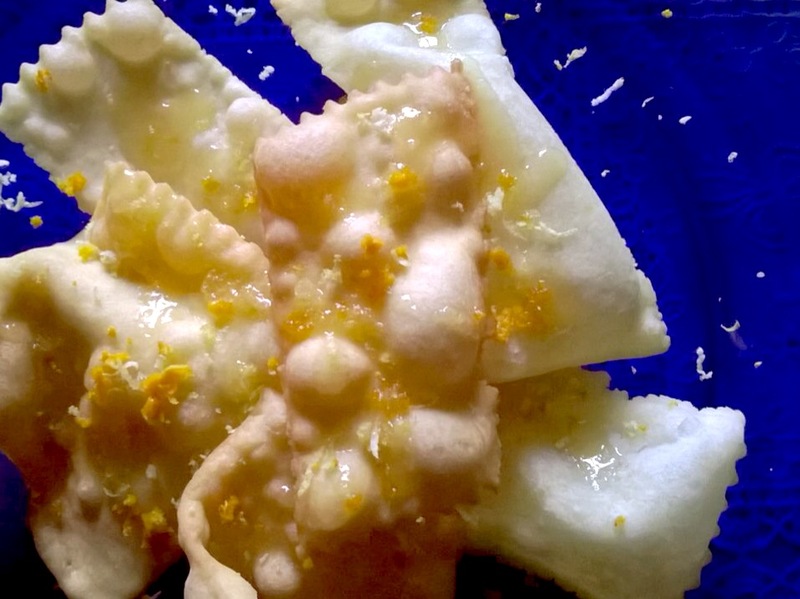 Other bloggers suggest other shapes and I would recommend this one from Giallozafferano (my favourite recipe blog from the talented Sonia Peronaci). Susan, you should try them! Absolutely delicious! !